Recipe No.2 from Everyday Dorie, selected for this week at Cook the Book Fridays, Maple-Syrup-And-Mustard Brussels Sprouts. I did not have any maple syrup, so I've used honey because Dorie says we can 😃. Instead of steaming the brussels sprouts, I microwaved them, with a tablespoon or two of water sprinkled over, along with the sliced shallot, garlic, salt and black pepper, on high for 2 minutes. Meanwhile fry the bacon until crisp, remove and keep aside. The brussels sprouts are then stir-fry in the bacon fat (I did not remove all of the fat! Ha!) until they are are charred and crisp-tender. I've used a mixture of both smooth Dijon and grainy mustard, mix-in with the honey. These are added to the brussels sprouts, stir until they are coated with the mustard-honey glaze. Stir in the crumpled crispy bacon. And as suggested by Dorie, I added a splash of balsamic vinegar in the final stir. This is delicious. Love the flavours of the honey, mustard, bacon and the crisp-tender texture of the brussels sprouts. I actually ate this for lunch on its own! And would definitely make this again as a side dish to a meal. Yums! Please do visit my friends' links at CtBF and see what they think of "Maple-Syrup-And-Mustard Brussels Sprouts". This was good, and I had it on its own Too! I LOVED this dish and will be making it again soon! I ate lots of brussels sprouts last weeks and going to get some more tomorrow. Yours looks yummy! I didn't remove all the fat either. But nobody needs to know! Isn't it great that there's so much flexibility with these recipes? This was so good, I enjoyed every bite. I only made half the recipe for myself and there was enough for two meals. probably the vegetable I rarely cook, looks so good. 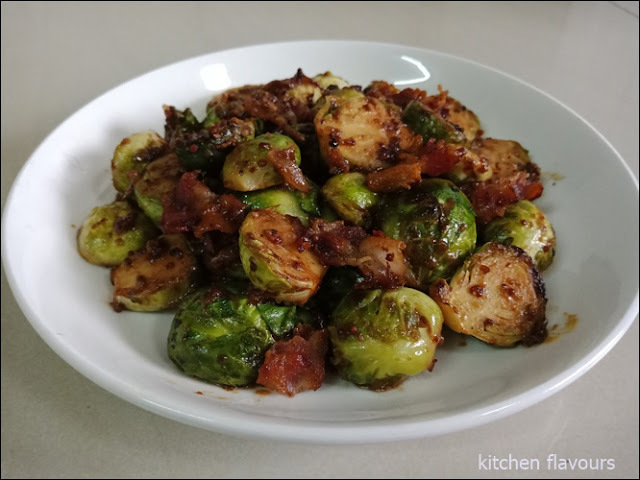 Mykinda brussel sprouts with crispy bacon ... opps with the fat! Enjoy ! It was my first time buying brussels sprouts and making this dish! I do love how easy it was to put together! mm...the microwave method seems easy enough too! Microwaving is a great idea. I don’t know why I don’t do it more often. I forgot about the splash of vinegar - I'll have to try that next time. And microwaving is a great method for this sort of thing. Teresa, from One Wet Foot. Indeed we loved this dish. It was such a great glaze with the mustard and maple. But I can imagine that honey was also a great substitute! Joyce, your dish looks amazing!!! This really was awesome, wasn't it. I think it would be difficult to go wrong with those substitutions. I didn't try the splash of vinegar, but seems like a perfect idea!! This sounds really good, Joyce! I have her cookbook and missed this one and will be trying it soon. Thanks! Oooh love hearing that the honey did well too. How could it not though, right ?? Your sprouts look relish. Good to know because even though I love maple syrup, sometimes folks want their sweeter without this flavor. Well done you on the microwaving - I had thought about going that route but skipped it for this one. Lesson learned lol. Honey. Good to know that it works as well. Yours look delicious. In fact all our photos just popped off the screen. Brussels Sprouts are very photogenic, don't you think. I made half the recipe and paired them with a rack of lamb. Perfect. With the few left over, I ate cold and didn't even bother to make the salad that Dorie suggested. Please don't tell. Tasty effort, Joyce.